I can count on Joanne at Novel bookstore in Memphis, TN for a good book recommendation. This book that she recommended has all the elements I like: a bit of mystery (it’s a murder mystery), plot flow that keeps my undivided attention, and a bit of the environment. The novel begins when the body of a local lothario, Chase Andrews, is found dead beneath the water tower at the edge of the marsh. 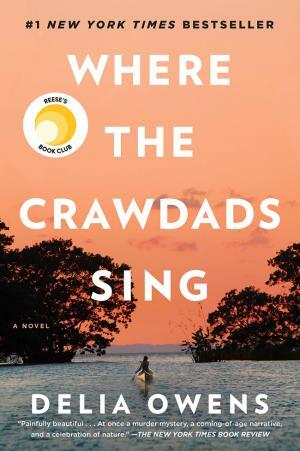 The main character is Kya Clark, aka “The Marsh Girl,” who grows up practically on her own in the wild marshes of a small coastal community in North Carolina, Barkley Cove. Still pre-school age, her story begins with abandonment by her mother, and then abandonment by the rest of her older siblings one by one. She is left to mostly fend for herself as her father is an incorrigible drunk, often gone for days at a time. She lives almost exclusively on grits, which she has to figure out on her own how to cook. A local fisherman’s son, Tate Walker, befriends her, visits often, brings her feathers, and teaches her how to read. They become close friends and confidants. But the marsh with all its abundant wildlife and flora becomes her real family and teacher. The local school attendance counselor comes to visit Kya and convinces her to come to school. Kya tries it for one day, but with all the negativity she receives from the other children, she vows never to return. Her learning continues with Tate’s tutelage and her intense observation of all the wide variety of life in the swamp. All goes fairly well until Tate goes off to college, when she is abandoned once again. Then Kya meets Chase, who, of course, takes advantage of her, and that’s when the plot gets complicated. Owens takes us through to the time that Chase is found dead and the local sheriff arrests Kya for his murder. More plot twists, and the reader is led to believe that Kya is not capable of his murder, hoping she will be eventually found innocent. The reader’s wish comes true, but there is an additional plot twist that posits a bit of doubt in the reader’s mind. What really impressed me about Kya is her amazing learning capability, becoming an expert through her intense and intimate observations of the life forms in the swamp, and by also reading as many scientific books from the local library as possible. She publishes several books about life in the marsh: The Seashells of the Eastern Seaboard , Eastern Seacoast Birds, and another on wild mushrooms. She is recognized in the academic and literary community for her amazing expertise. It is fitting that Owens’ character have such expertise because, as she was growing up in rural Georgia, Owens’ mother encouraged her to explore nature, saying “Go way out yonder where the crawdads sing.” Owens grew up riding horses around Thomasville, Ga. She learned how to hike and spent her life in the wilderness and, since childhood, has thought of Nature as a true companion. So it is with Kya. Owens now lives in Idaho, where she rides her horse as far into the wilderness as she can go. Find more information about the author and see photos of Owens with her horses on her website at: www.deliaowens.com/about-the-author.